…Deb Corey and Cheterra Hall! Thanks to random.org for helping pick the winners and thanks to all of you for entering…we enjoyed reading all your comments. It seems like a lot of people are looking forward to checking out the Grilled Cheese Truck, as well as both Suite 106 and My Delight cupcakeries. Also, lots of you seem to be having birthdays right around June 18. And those of you suggesting stretchy pants are evil geniuses! I hope those of you who didn’t win will still get tickets and show up with empty bellies! Tickets are available at Ticketmaster and at the Citizens Business Bank Arena box office, if you want to avoid some of those pesky “convenience” fees. Pre-sale tickets are $8 now, but remember…they will go up to $10 a week before the event. A limited number of VIP tickets, which will grant you entry into the event an hour early, are available for $25. We’ve included some of our favorite comments after the jump. Original Tommy’s continues its 65th anniversary celebration with yet another Tommy Tuesday special next Tuesday (May 31). Just by uttering the secret phrase, “Memorial Day”, you’ll be able to get a chili dog for only 99 with any purchase at any Original Tommy’s. You can order up to five at that price. As usual, the deal is good from 10 a.m. to 10 p.m.
For more information, click here to see Tommy’s Facebook event page. Looking for that special restaurant to celebrate that once-in-a-lifetime event? Fleming’s Prime Steakhouse & Wine Bar (recently voted “Best Steak” by Daily Bulletin readers) has created a “Prime Celebrations” three-course meal designed for young adults to celebrate prom season and graduation in style. The complete dinner includes an appetizer salad or soup, an entre, a side, dessert and beverage. Cost is $50 per person, $100 per couple, and includes tax and gratuity. For convenience, parents can even pre-pay for the meal. Reservations can be made online here or by calling Fleming’s directly. The “Prime Celebrations” meal is only available through June 30. For more information, click here. Follow the jump to see the menu selections. Well, at noon tomorrow (May 27), 66ers Account Executive Jordan Smith will be at Qdoba Mexican Grill in Redlands for lunch. He’ll have plenty of 66ers tickets (and several pairs of Angels vouchers) to share. Free baseball tickets sounds like a pretty good way to start your extended weekend! The Redlands Qdoba is at 9990 Alabama St.
What’s the most inventive and fun way you could come up with for mashing potatoes? For nine-year-old Faith Joiner of Twin Peaks, the answer was: Hippos! Faith’s imagination garnered her the grand prize — $5,000 in cash — in the national Ore-Ida Steam n’ Mash “Mash Destruction” contest. The contest was used to promote Ore-Ida’s new Steam n’ Mash frozen, pre-scrubbed, pre-peeled, diced potatoes, which are ready to microwave and mash in minutes. 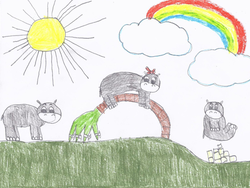 Her winning entry, titled “The Hippo Smash”, shows hippos lining up to hop on a palm tree to catapult onto a pile of Steam n’ Mash potatoes to create mashed potatoes. All 35 SoCal Chick-fil-A restaurants (including the ten in the Inland Empire) will honor those who have served in the service with a Military Appreciation Night from 4 to 7 p.m. tonight (May 25). All active military personnel and those who have honorably served, along with their immediate family members, can go to any Southern California Chick-fil-A for a free meal. There will also be family-friendly activities and entertainment. Chick-fil-A’s Military Appreciation Night is presented by the Veterans of Foreign Wars Foundation and United Services Automobile Association, in conjunction with the VFW Foundation’s Return the Favor campaign. The details: The free offer is only valid with a military ID or proof of service in-restaurant. The offer includes the Original Chick-fil-A Chicken Sandwich Meal, Chick-fil-A Spicy Chicken Sandwich Meal or Chick-fil-A Nuggets (four-count) Kid’s Meal. Redlands: 27520 W. Lugonia Ave.
Upland: 1949 N Campus Ave.
Rancho Cucamonga: 12190 Foothill Blvd. Chino Hills: 3640 Grand Ave.
Congratulations to the Best of… winners! So the Best of… special sections came out this Sunday for The Sun, the Daily Bulletin and the Redlands Daily Facts. I have mixed feelings about the winners. I agree with some of the chosen “bests,” but not with others. Some just left me scratching my head. Asian cuisine, Daily Bulletin: I like P.F. Chang’s. Sure, it’s Americanized, but it’s also consistently good. My sister-in-law got the entire family hooked on P.F. Chang’s, and I remember driving all the way out to Fashion Island in Newport Beach just to eat there. And wait hours to do so. Now we can just head to Riverside or Victoria Gardens. The wait is also much less. Brunch / Romantic restaurant, The Sun / Daily Facts: The Castaway has the best view of all the restaurants in San Bernardino…and probably the whole east valley. The good thing is that the view isn’t the only good thing about the Castaway. The food quality is also quite good — you get what you pay for, and having Sunday brunch there is like taking a little vacation. Buffet, The Sun / Daily Facts: Kudos for going out on a limb here. Choosing an Asian buffet like Open Kitchen in Highland over the usual suspects (Hometown Buffet, Souplantation, Sizzler) shows some spirit. And Open Kitchen’s food is indeed better than 90% of those Asian buffets out there. My favorites are the spicy chicken, made with jalapeno, the salmon sushi and the jin deui (sesame seed ball pastry). Italian cuisine, The Sun / Daily Facts: I recently revisited Isabella’s Ristorante Italiano in Redlands. Unsurprisingly, the food was just as delicious as I remember it. Of course, the last time I went to Isabella’s, they still had a restaurant in San Bernardino. It’s good to know some things stay the same. Buffet, Daily Bulletin: While I think The Sun and Daily Facts readers were spot on with their buffet choice, I think the readers of the Daily Bulletin were way off. Are there no other buffet restaurants in the west valley than Hometown Buffet? Have all the Sizzlers closed? (Oh, wait a minute, I believe they might have!) Have they never been to the Rancho Cucamonga Souplantation? Apparently not, or maybe they’re just fond of bland food. Mexican cuisine, The Sun / Daily Facts: I’ve never understood the appeal of San Bernardino’s landmark Mexico Cafe. The few times I’ve been there over the years, I’ve been seriously underwhelmed. And yet, year after year, it tops our “Best of” list. Of course, a friend went there recently and said his meal wasn’t too bad. Perhaps it’s time to revisit the Mexico Cafe. Sandwich shop, Daily Bulletin / The Sun / Daily Facts: I think the lowest common denominator for sandwich places is Subway, which is probably why they were chosen as the top sandwich shop for all three papers. I know there are better sandwich shops out there. Let’s start with Matano’s Little Italy in Yucaipa, which surely must be the best-kept secret out there, despite my loudly singing its praises. Yogurt / Ice Cream, Daily Bulletin: Golden Spoon over 21 Choices? Over Pinkberry? Over Burt & Rocky’s? Over Dine 909 favorite Handel’s? You’ve got to be kidding me! Queen of all Redlands Martha Green came out on top in several categories. For The Sun and Daily Facts, Dough’Lectibles won for both bakery and desserts, while The Eating Room was chosen best restaurant to take out-of-town guests. In-N-Out won for best burger in both surveys. We’ll see if that changes next year with competition from Five Guys Burgers and Fries and The Habit. Can someone please tell me where Armada, The Sun / Daily Facts Asian cuisine winner is? I’ve tried Google, Yelp, Bing…all to no avail. The closest match I can find is Armada Towing in San Bernardino, but you won’t be getting egg foo young from them. Pronto Pizza over Dine 909 favorite the Gourmet Pizza Shoppe? Seriously? I have to admit that I haven’t yet tried Pronto, but how good can it be for $5? Perhaps that’s the sole reason it topped The Sun / Daily Facts survey. Just one more thing: Who is the joker who voted for Olive Garden for best Indian cuisine (The Sun / Daily Facts)? Follow the jump to see the full list of restaurant winners and losers favorites. Offering a great deal like a 65 chili cheeseburger and Coke combo is one way to get people to notice. However, just because they served 10,000 people last Sunday (May 15) at the original Original Tommy’s doesn’t mean they’re through celebrating. The deal is good from 10 a.m. to 10 p.m.
Today’s the last day for a free $10 FunCard at John’s Incredible Pizza Co.
Not only do you get a free $10 FunCard for yourself, but you’ll be helping the fight against cystic fibrosis. Here’s how it works: Print out this coupon, take it to John’s Incredible Pizza Co., give them the coupon, purchase an adult buffet and beverage, and you’ll get a free $10 FunCard. John’s will also donate $1 to the Cystic Fibrosis Foundation’s Great Strides 2011. Unfortunately, today (May 20) is the last day to get in on the deal and help out. 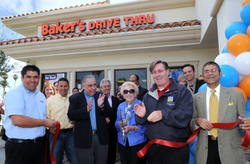 This week another Baker’s Drive-Thru opened in the fair city of Riverside, with a ribbon-cutting ceremony on Monday (May 16). The latest “twin kitchen” is at 6686 Indiana Ave. The new restaurant replaces one just across the street (6681 Indiana Ave.) that had been in business nearly two decades. The old location will razed by Caltrans. They’ve sent along a photo of the ribbon cutting ceremony. Check out the guy in the checkered coat on the right. Wow! We like Baker’s well enough here at Dine 909, and love their egg burritos especially, but would like them even more if they stopped charging for soda refills. Although…I really can’t complain too much when they’re only charging 25 for a 16-ounce soda right now (or a small fries — limit two per order, one order per person or car) and $1 for a 32-ounce Coke Zero (or Gold Peak black or sweet green teas). Or that they even have Coke Zero, for that matter.